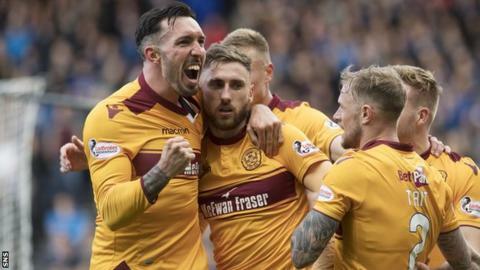 Louis Moult's two goals earned Motherwell victory over Rangers and sealed their place in the Scottish League Cup final at Hampden Park. The in-form striker netted for the ninth and 10th time this season, as the Steelmen secured a date with defending champions Celtic on 26 November. Rangers squandered a host of chances, with Josh Windass, Carlos Pena and Declan John among those passing up opportunities. And there was late controversy too, as Moult clashed with Gers defender Bruno Alves, after both managers had been sent to the stands. Here, former Scotland captain Willie Miller, who won three League Cups with Aberdeen, assesses the performances of those in action at the national stadium. The keeper was at fault for the first goal and was also caught off his line at the second, so all in all not a great day for him. The full-back wasn't his usual self going forward. He wasn't the influence I expected him to be on the game and can do much better. I thought he did ok as Rangers didn't have much defending to do. He was up against a physical challenge in the Motherwell forwards but was up for it. Went off after an elbow to the face. Eventually lost the plot and could easily have been sent off late in the game for a kick-out at Moult. With his experience he shouldn't be getting involved in such situations. He was the better of the two full-backs and was a good outlet going forward. Got a few good crosses into the box and was one of Rangers' better performers. He did ok in the midfield. He was the only one in the Rangers side that showed some composure in the second half when the game was slipping away from his team. I thought this game was made for him to stamp his authority on it, but he was unable to do it. Offered nothing, other than keeping Carl McHugh occupied. Was replaced after an hour. The winger took up some good positions but his crossing wasn't good enough and he had a couple of wild shots at goal. Effective up to a point. He got himself into dangerous positions but was unable to connect properly on a few occasions. Lacking composure in front of goal. Well marshalled by the Motherwell defence and struggled to get into it. Wasn't in the right places at the right times. Couple of good runs and he showed his pace without having a significant impact. Came on in a difficult situation but the youngster did well enough. Game was all but over by the time he came on. A very confident performance from the keeper. Did extremely well with anything that came his way and was a safe pair of hands at corners when his side needed it most. Wasn't as effective as he usually is, although he had a better second half like many of his team. Left some space in behind him in the opening 45 minutes. His manager said after the game that he was unwell and he certainly played like he was under the weather. His positioning was off and his timing was completely out of sync. Played like a man that should've been in his bed. Dogged display in that back three. He is a good physical presence, although Rangers did create plenty in the first half. Much stronger second half. Defensively, a very good display as he kept things tight down the left side. The full-back wasn't particularly effective. He didn't get forward as much as I'd have expected and was exposed defensively a few times. I was expecting a bit more from the youngster. The Motherwell midfield was overrun in the first half. He has been doing well but this wasn't a great day for him. Not much of an influence on the game but probably did exactly the job he was asked to do. A lot of his game was spent nullifying any potential threat from Pena, and he did that well. I'd rather have him on my team than against me, although he should have been sent off. Seemed to elbow Cardoso in the first half, which he was booked for, but got away with a worse one on the same player in the second half. A guy who can lead the line, has a great physical presence and works hard as well. He took up a great position for the first goal and his second was simply delightful. By the end Alves had lost the plot trying to cope with him. Showed some composure and put his foot on the ball when his team needed it. On too late to make an impact.